Men leaving the toilet seat up is their most annoying habit, according to a survey of their other halves. More than half the women quizzed (54%) said failure to put the seat down was their man's most irritating trait.Leaving wet towels on the bed was the second most frustrating habit (23%), followed by a propensity to leave dirty laundry on the floor (15%). Other annoyances cited included snoring, doing a bad job at the household chore for the fear of being asked to do it again, not replacing toilet roll, leaving toenail clippings and loose change around the home, drinking straight from the milk bottle and refusing to ask for directions when lost. 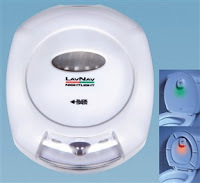 Our solution - the 'Lav Nav' - a small device which attaches to the toilet lid, lighting up the toilet in the dark and shining green when the seat is down and red if it is left up. The Lav Nav is ideal for fed up women everywhere - not only is it now easier to find the loo in the dark but the red light is a handy reminder to forgetful men that leaving the seat up is just not on.